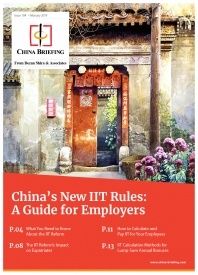 China’s software as a service market is one of the fastest growing industries in the country. China Briefing examines the drivers of growth in the industry and analyzes prospects for foreign investment. The Chinese software as a service (SaaS) industry is starting to boom. According to Zhiyan Consulting Group, the market will double in just over two years from 2018 to 2020. In this article, we analyze the prospects for foreign companies thinking of entering the Chinese SaaS market. SaaS is a software delivery model whereby software is provided on a subscription basis over the internet rather than installed directly on the customer’s own hardware. The advantages are that no additional software or hardware needs to be installed, the setup is much quicker, and software updates are usually included in the subscription. The disadvantages are that customers have less control over software customization, sensitive data can often be accessed by the provider, and the software requires internet connection for use. 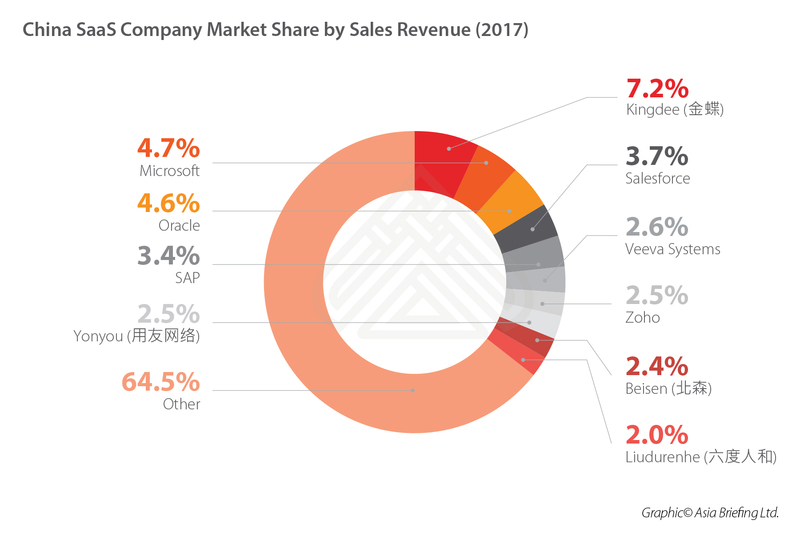 The Chinese SaaS market is still relatively small, indicating that there is significant room for foreign firms to be strong competitors in both developed and underdeveloped product segments. In 2017, the software and information technology services industry as a whole was valued at RMB 5.5 trillion (US$825 billion); the SaaS industry, however, only had a market size of RMB 16.9 billion (US$2.5 billion). Currently, customer relationship management software (CRM), office automation software (OA), intelligent manufacturing software (IM), and office collaboration software are the most developed product markets in China. 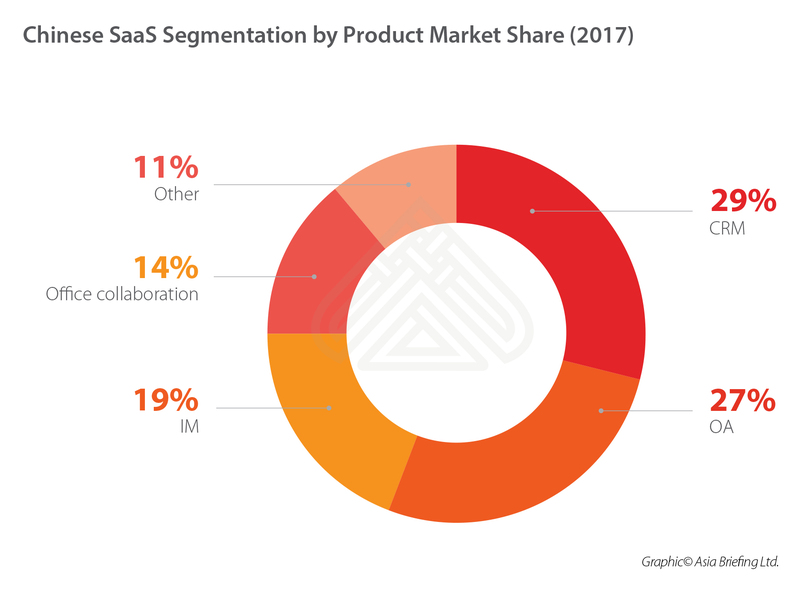 Other business segments are still in the very early stages of expansion but are expected to grow as the SaaS market develops. From 2013 to 2015, the Chinese SaaS market grew at around 65 percent to 75 percent per annum before leveling out in 2016. 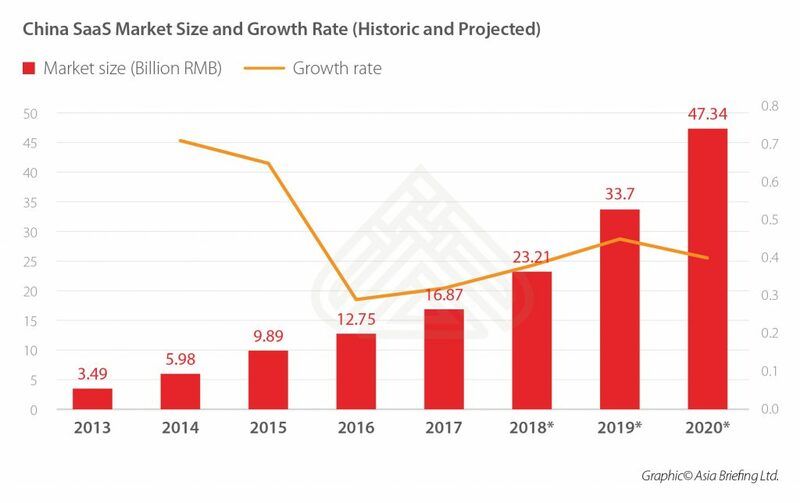 From 2018, a growth rate of 35 percent to 45 percent year-on-year until 2020 is expected, where the market size is projected to hit RMB 47.3 billion (US$7.1 billion). The Chinese SaaS market will grow from a 3.6 percent share of the global market in 2014 to just under 10 percent in 2020, further highlighting it as an excellent destination for expansion for foreign companies. The Chinese SaaS market is extremely fragmented. The top player is Kingdee with a market share of 7.2 percent. The top 10 companies in terms of market share control only 35.6 percent of the market. No big market leaders have emerged yet, nor have local firms expanded out of China. This is mainly because the domestic market is still developing, and firms are benefiting from domestic growth. The lack of consolidation means that even small foreign entrants with a quality product and an effective strategy will be able to compete in the Chinese SaaS market. China is beginning to shift away from commodity hardware to cloud-based infrastructure. From 2017 to 2019, the growth rate of hardware is predicted to fall five percent and be replaced by growth in cloud-based services revenue. For example, in 2017 combined cloud and non-cloud enterprise resource planning (ERP) software revenue grew by RMB 3.3 billion (US$49.5 million). Even though SaaS ERP represented only 5.8 percent of total ERP revenue in 2016, just under 30 percent of the RMB 3.3 billion growth came from SaaS ERP. Large companies and state-owned enterprises (SOEs) have been slower to take up SaaS software because they have often made pre-existing capital investment in traditional enterprise software and hardware. There are also concerns regarding data security because sensitive data is often stored on cloud infrastructure and accessible by the SaaS provider. Small and medium enterprises (SMEs), however, have tighter capital budgets party due to low access to finance from the banking system. This means they are more attracted to the SaaS subscription model. Around 99 percent of all companies in China are SMEs. 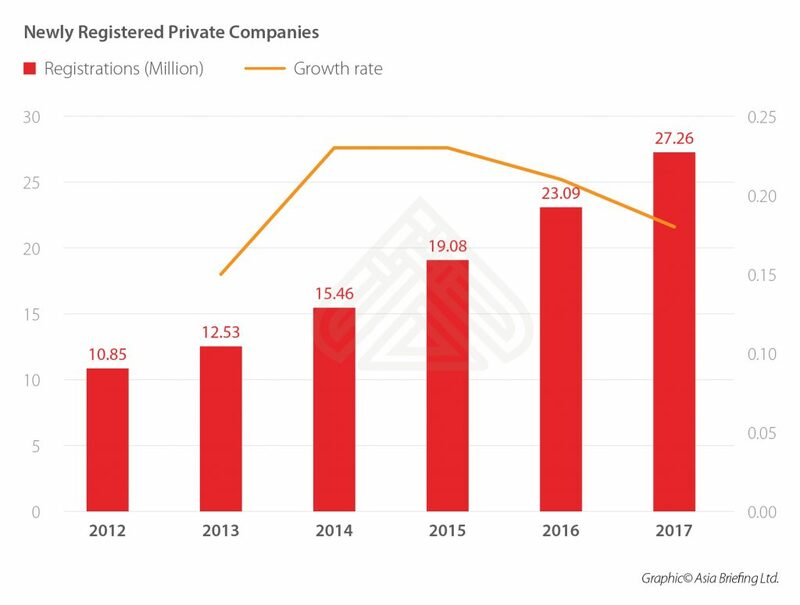 From 2012 to 2017, new registrations of private companies increased by an average of 20.2 percent every year. The continued growth of private SMEs will continue to deepen the market for SaaS products considerably. The major challenge for the industry, however, is to build interest in enterprise software among SMEs, as less experienced SMEs often do not understand the benefits that the software provides. As wages continue to rise and the cost of labor becomes more expensive, simply hiring more labor will no longer be as sensible to solve business problems. Going forward, firms will increasingly have to focus on labor productivity to save costs. 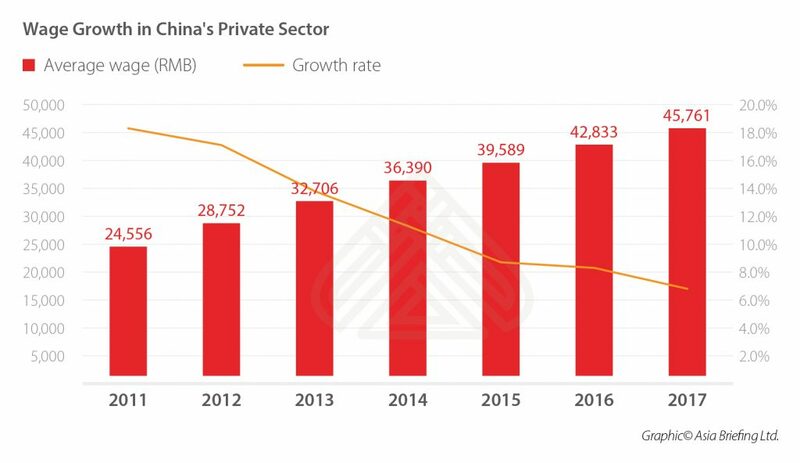 The average private sector wage in China has seen consistent growth. From 2010 to 2017, private sector wages have been increasing at an average of 12 percent. Sitting at just under 7 percent growth in 2017, average private sector wages grew to about RMB 46,000 (US$6,900). And in Beijing it was as high as approximately RMB 71,000 (US$10,650). As private sector wages continue to grow, SMEs will begin to rely more heavily on productivity, driving growth for SaaS solutions that streamline business processes. The SaaS software must be located on a server in China. If the server is located outside China, it is illegal to provide SaaS services. 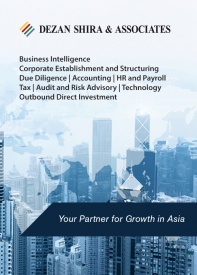 Despite regulation indicating that joint ventures can provide SaaS services, the provider must be a fully-owned Chinese entity. Foreign firms cannot be issued internet content provider (ICP) licenses. As such, the Chinese entity providing the service must obtain one itself. The only other option is to operate the server outside China. This makes the connection speed much slower and is not recommended due to its illegality. Furthermore, the URL can easily be blocked by the government, so any company seriously wanting to enter the market should not pursue this path. The central complication arising from the legal requirements is finding a Chinese provider that is willing to obtain an ICP licenses. Obtaining ICP licenses are very expensive and the Chinese licensee must pay all the costs. As such, the provider must not just have the technical capability to operate the server but also the financial resources to obtain the license. For more established SaaS providers, another problem is that the Chinese provider might actually be a competitor. This brings with it intellectual property concerns given the Chinese provider will have access to all the data and software on the server. Furthermore, the data on any server located in China can be accessed by the Chinese government. Selling SaaS services is nevertheless often safer than traditional software delivery methods because customers do not have direct access to the software’s code. 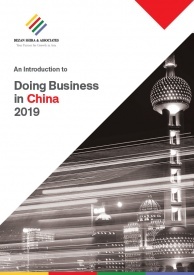 In general, Chinese business practices make it difficult for foreign firms to be successful if they do not understand them. Because partnering with a Chinese firm is necessary for entering the Chinese SaaS market, firms need to be accustomed with practices such as the concept of managing mianzi (face) in the process of relationship building. Conducting proper translations into Chinese. Domestic firms also have exclusive access to the lucrative SOE market because of the government’s domestic procurement policy for technology products. Nevertheless, as much of the growth is expected to come from the SME market, this should not be a huge concern. Despite these difficulties, of the top ten companies in terms of market share, as many as six are foreign firms. This shows that by working with experts to create the right strategy and tailoring the product to local needs, it is very possible for a foreign firm to succeed in China in the SaaS market.